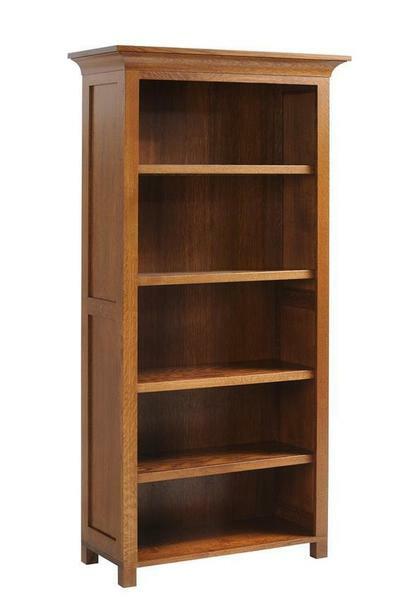 Organize your work space in style with the Coventry Mission Bookcase. Handcrafted by skilled Amish craftsmen, this solid wood bookcase is available with a generous selection of optional features to make it your own including back type, doors options, height & width options, hardware type, & a variety of woods & finish options to complete the custom ordering process of this built-to-order one-of-a-kind Amish bookcase. I just wanted to thank both of you for your help in getting my order to me. The furniture is absolutely beautiful and incredibly well-made. I had some doubts about ordering furniture from a website without ever seeing it in a showroom, but the desk, hutch, and bookcase that I received really exceeded my expectations. I’m already looking through the website to put together my next room – (this one will be a bedroom). Thanks for all your help in answering my questions at the time of the order and helping me make sure I ordered the right stains and wood type. You can put me on the list of very satisfied customers.